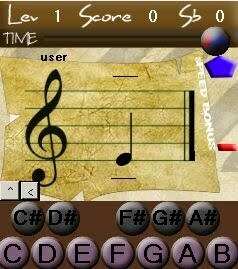 Music Trainer is an exciting game wherein at the same time, you can be trained by Music Notes. It is so perfect for all musicians or music lovers specially for those who are learning Piano and other Instruments that is capable of reading music notes. It is exciting because of different levels you will encounter. There are Ten Level Challenges you will encounter With Top Scores Recorded so you may challenge your musician friends and enjoy! You may Enjoy the "FULL GAME" Levels and Features when you purchase the Full Version of the Game With Sharp Keys so you may be fully trained in reading notes. This game is designed specially for musicians such as piano players, violinist, and other musical instruments that reads notes. and Just Letter buttons for others who dont play piano. We are thinking widely about this unique kind of game and we are still planning to develop more that has more features and functions. Helping us grow can help us develop more in the future.